Sixteen years ago I wrote the following lighthearted poem in honor of my husband Roger and two friends, Roger and Mike, who raced our sailboat in the 1998 National Catalina Race held in Westbrook, Connecticut. They took first for the tall rig division in all three races. Yes, readers, the sailboat’s name was Sloopy, the inspiration for the fictional 36 foot sloop that Liz and Garret live aboard in Murder in Mystic, Murder in Newport and Two Headed Snake of Key West. Our Sloopy was fast and my husband could make a mighty Margarita. I am sharing this with you in memory of my husband, who passed away on July 1, 2014. Sail on, my captain. As they hoisted the main. There’s proof in the loot. Be good to your wife. 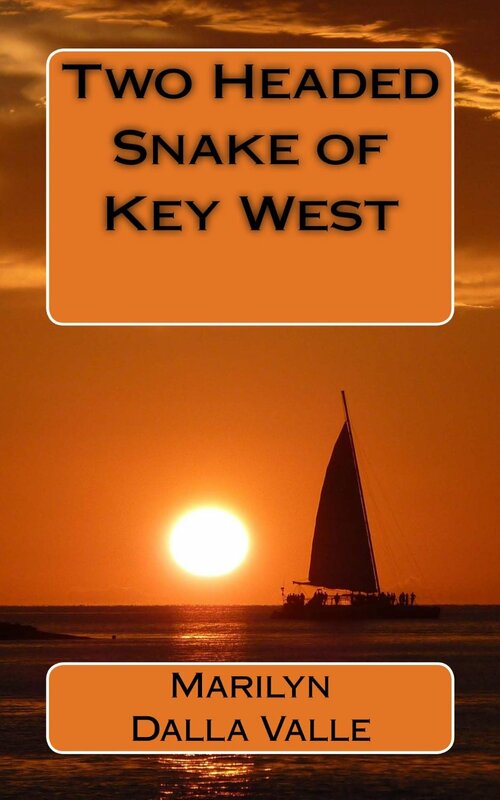 First chance to get a FREE Amazon kindle copy of Two Headed Snake of Key West, the third Liz Adams Mystery from May 16-18. Mark it on your calendar! If you review it on Amazon, I will give you a free kindle copy of your choice- Murder in Mystic or Murder in Newport. Just fill in the contact information below when the review is posted. Happy Reading! Shake vigorously. Pour over ice. Liz Adams experienced uncontrollable feelings that warned of danger. Her husband, Garret, hated the toll each episode levied and trusted her gut. Living their dream, Liz and Garret sailed their 36 foot sailboat, Sloopy, from Mystic Connecticut to Key West, Florida, arriving at sunset. The fiery orb melted across the horizon, cannons rumbled, cheers resounded and the partying commenced. While out on the town, the cruising couple stumbled upon Jonathan, a friend from home. That night, the dreams started. Jonathan was in danger. Runaway wife, possessive husband, predator, the mob, priest, bartender and cruising couple collided at the southernmost tip of the Florida Keys. Greed, power and jealousy caused brittle relationships to snap. Margaret Wilson, fed up with her inattentive husband, Edward, hopped a plane to Key West, where she met Miguel, captain of Predator, a charter boat. Ego driven and afraid of confrontation, Edward hired the mob to do his dirty work. A chased ensued. The priest provided sanctuary. Murder rocked the tiny island. Jonathan discovered the body and was arrested. Puzzled by her dreams and fragments of psychic messages, Liz snooped for missing pieces to complete the picture and free her friend. Knowing that his wife hunted like a bloodhound on a scent, Garret had her back to keep her safe. Two heads of the snake, good and evil, struggled from beginning to end until one was victorious. Each made a choice and lived with the consequences. Finally! Long awaited Two Headed Snake of Key West has been published in paperback and kindle format. Find it on Amazon. Join me in the celebration with one of Garret’s margaritas. Free Murder in Newport Audiobook Giveaway. First 10 to register on the contact form at www.marilyndallavalle.com will receive a free audiobook download at audible.com. This past week POSITIVE has been attacking me from all sides. A friend sent me a book by Joel Zeff, Make The Right Choice, Creating a Positive, Innovative and Productive Work Life. His premise is that we all need Positive Support. He walks through several examples of how to give positive support in the workplace. Chapter Five is my favorite. He states that Fun, Passion and Happiness are choices. The onus is on the individual. Challenges and frustrations pop up. It is how we deal with them that makes a difference. On Thursday, my sister invited me to a book signing. Title of the book is Profit from the Positive: Proven Leadership Strategies to Boost Productivity and Transform Your Business. There it is again! Is this synchronicity or is the world going positively positive? One of the authors, Margaret Greenberg, talked the talk and walked the walk. She was vivacious and warm as she gave a short explanation of positive psychology and her career as a business coach. My brain churned all that I had learned. Was all this positive energy going to fry it? I needed real life examples, not theories and empty promises. Again, I asked and the universe provided. The best teachers were standing in front of me, two boys, ages 12 and 10, who are my idols. They swim competitively, having learned at a young age about hard work, discipline, winning and losing. Swimming is an individual sport. There is no passing the buck. The will to dig deep resides within whether the ranking is twenty-sixth or first. Last weekend I had the pleasure to witness the 4 day Eastern Zone 2013 Long Course Age Group Championship in Richmond, VA. The pool area was packed with children from New England, Tri-state and Mid-Atlantic regions. Each child endured hours of waiting to swim one or two events per day that would last 30 seconds to 4 minutes, depending on the event. The positive energy from the children and the parents in the balcony was electrifying. As stated in the Nike logo, “Just do it” and have fun at the same time. Let the inner child out. I am Positively Positive that is the path to happiness.